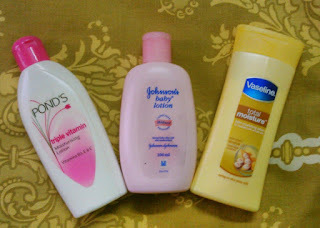 Today am going to talk about the three moisturizing lotions which have never failed for me and probably will never fail for you. I have dry and rough hand and feet skin. I can never ever miss going out without applying lotion to my hands and feet. I tend to be lazy when it comes to applying lotions at night before sleep. So let us come to the point and talk about the three lotions. This lotion is safe and light in texture as it is made specially for babies and infants. I recently started using this lotion when my son was prescribed another brand. For adults a little more amount is needed but I must tell you the feeling of applying this lotion is heavenly. Priced at 80 INR for 100 ml with 3 years shelf life. I have used this product over the years and am amazed how over the years the brand has maintained the quality. I usually use it to treat my dry feet. I use it for my hands too and just love the aroma of it. Priced at 65 INR for 100 ml with 3 years shelf life. Pond's Moisturizing Lotion Pond's Moisturizing Lotion is my all time favorite lotion. The lotion is a little sticky sort of lotion but it moisturizes my dry skin very well. So I have no complaints there. The fragrance of this lotion is a typical Pond's product fragrance, if you have used the Pond's face powder you would know what I mean. Priced at 60 INR for 100 ml with a shelf life of 2 years.